ACT announced a breakthrough software capability designed to guide students to education resources that address their individual learning needs. The Recommendations and Diagnostics (RAD) engine, delivered through an application programming interface (API), was recently integrated into ACT Academy™, ACT’s free online learning tool. ACT Academy helps students improve their academic skills by giving them access to its collection of online learning resources. Each student receives a personalized study plan, based on ACT Academy’s diagnostics or scores on the ACT test, PreACT®, or an official ACT practice test. As students take quizzes or tests on ACT Academy, RAD continuously tracks their mastery of specific academic skills. Then, based upon the results, it recommends education resources—including lessons, videos, games and other content—that address key skills the student has not yet mastered. It’s all done in real time. RAD was developed by ACTNext™, ACT’s multidisciplinary innovation unit, using the principles of computational psychometrics (AI-based algorithms fused with psychometric theory). While ACT Academy is the first online learning platform to integrate the power of the RAD engine, it will not be the last. ACT envisions many more potential uses of the capability in the future. RAD can be integrated into any system that has a set of learning standards underlying its instructional content, and it was developed in such a way to make it adaptable by assessment and learning programs with ease and efficiency. For example, in addition to ACT Academy and the ACT Holistic Framework®, the RAD engine may interface with other measurement resources based on skills hierarchies, such as specific state learning standards, Next Generation Science Standards, and the Common Core State Standards. ACT is also partnering with Smart Sparrow, a courseware design platform provider, in order to deliver RAD in an easy-to-configure way to thousands of courseware design teams worldwide. More information about the RAD engine can be found on the ACTNext website. Our ACT/SAT tutors will come to your home on weekdays or weekends. ACT/SAT prep is available throughout Charlotte, NC and surrounding areas. Vint Hill Educational Services offers mock testing for the ACT and SAT. These administrations are hosted in the Northern VA area and the Richmond VA area. We supply the test booklet, essay booklet, answer sheet, testing timer, extra pencils, and a proctor. Students will need to bring: a calculator, two No. 2 pencils, snacks, and a drink. Each student receives a 9 page diagnostic report using our test scoring software. We only use official ACT and SAT practice tests. 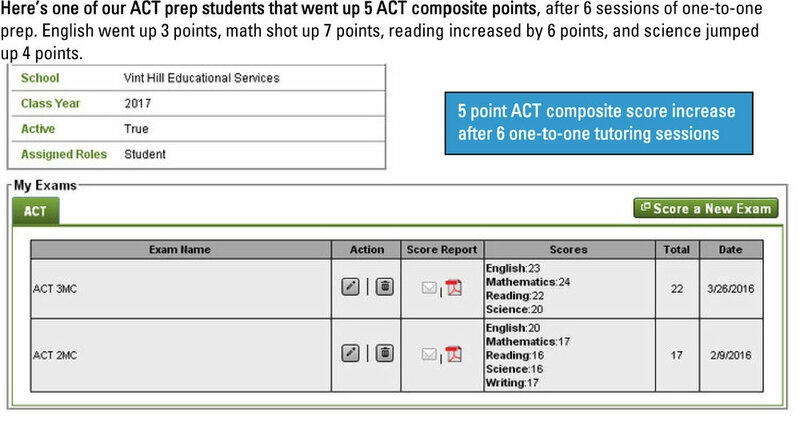 Students that take both an ACT and SAT will receive a student scores comparison chart. This will reveal which test the student is scoring higher on, ACT or SAT. The ACT science section does not test specific science facts. Instead, students will need to understand how to use certain skills of scientific reasoning. Nearly every question can be answered by referring to the material in the passage. Yet, somewhere between 1 and 5 questions on every ACT test, will concentrate on science-based knowledge not given in the passages. There will be a few questions that require some arithmetic. You may have to find an average or utilize your algebra knowledge. Students receive 1 raw point for every correct answer. There’s nothing lost for answering incorrectly. The raw score is calculated by tallying up the raw points. The overall raw score is then converted to a score on a 1-36 point scale. The ACT science score is 1 of 4 scores that's factored into the ACT composite. The ACT composite is an average of 4 section scores. Meaning, a lower science score will bring down the ACT composite, and a higher score, will help to increase the ACT composite. This, of course, relies on the scores from the other ACT sections: English, reading, and mathematics. • 6-8 Conflicting Viewpoints questions. These questions will present two or more scientific theories. Amongst all of the theories, not all of them can be correct. The questions may not ask you to prove which theory is correct, but instead, ask you to describe the viewpoints and how they relate to one another. • 12-16 Data Representation questions. These questions usually present charts and tables that display different variables. Students will find 2-4 variables and must be able to describe the relationships between the variables. • 18-22 Research Summary questions. These questions describe an experiment and the scientific findings. The passage will detail the results, makeup, and hypothesis. The questions will ask you about the experiment’s findings, design, and implementation. Every ACT test will include the same set of instructions for the science section. Master the instructions and you won’t need to read them when taking the test. This enables you to spend more time on the problems by skipping the instructions. ACT SCIENCE DIRECTIONS: There are seven passages in this test. Each passage is followed by several questions. After reading a passage, choose the best answer to each question and fill in the corresponding oval on your answer document. You may refer to the passages as often as necessary. You are NOT permitted to use a calculator on this test. Watch out for attractor answer choices. The ACT anticipates the student making careless mistakes. The test will setup traps for students, and those most impacted, will be students who are not ready for them. The attractors mainly show up on medium to difficult questions. • Don’t worry if the subject is unknown to you. Most of the information is in the passage. The SAT reading test measures the student’s skills in reading, comprehension, and analysis. The passages are 500-750 words and the questions are divided into three areas: synthesis, rhetoric, and information/ideas. The SAT reading test contains 5 total passages and each passage has 10-11 questions. The student has an average of 13 minutes to spend on each passage. It’s best for the student to spend about 5 minutes reading the passage and 45 seconds to answer each question. The passages range from high school to college level content. - Ask yourself questions while you read. - Understand the question first then look at the answer choices. - Review to make sure you’ve found the best answer. Usually, SAT reading passages will contain a few answer choices that seem right, but they’re not the correct answer. Most of the difficult questions will try and throw you off. As you read the passage, be sure to stay engaged. Don’t read the passage passively and wait for information to come to you. Try to think about what the author is saying. Ask questions about the passage. Also, be sure to map out the passage by finding a main idea for each paragraph. Ask yourself: Why did the writer choose to write about this topic? If you come across a paired passage, read the first passage and then answer the questions pertaining to it. Next, read the second passage and answer the questions that follow. Lastly, answer the questions that go over both passages. - Don’t skim over the passage. - Focus on one question at a time. - Use the two-pass approach. - Don’t read the questions before reading the passage. - Read the passage first. Resist the urge to rush ahead. Taking time to read the passages thoroughly will pay off in the end. Students must actively read the passage first. - Don’t skim the passages. The reading questions require a strong understanding of the passage. Students must understand the author’s role and perspectives. A brief look is not enough to answer the questions with accuracy. - Only read one passage at a time. Answer all questions pertaining to a specific passage before moving forward. In order to maximize your score, spend your time focusing on the easier questions first. Each question is worth 1 raw point, regardless of the level of difficulty. - Focus on a single question at a time. Don’t feel the pressure to rush through the test. Relax and don’t think about the next passage. Be patient and you will find yourself working more accurately. Vint Hill Educational Services offers one-to-one SAT prep focused on the individual. Our program is customized and designed for each unique student. Unlike a group SAT prep class, we concentrate on individual student needs. Learn more about our SAT prep program. Our ACT/SAT tutors will come to your home on weekdays or weekends. ACT/SAT prep is available throughout Richmond VA. Vint Hill Educational Services ACT/SAT tutors reside in: Henrico, VA - Glen Allen, VA - Richmond, VA - Midlothian, VA - Tuckahoe, VA - Short Pump, VA - Mechanicsville, VA - Lorraine, VA - Ashland, VA, and many more!